xRose Brier Studio (moved): 2011, A Year to Celebrate! I was born in a year that ends in 1, so this is a decade birthday for me. Thinking about it last summer, I kinda freaked out. I know it's only a number, still it sounded old to me.
. . . I love my birthday, I always have . . .
. . . I think of my birthday as this special, all-about-me day. You can't really tell from the photo, but that was an amazing cake! It was angel food, the kind with a hole in the center. My mom was really good at cake decorating and she put a Barbie-like doll in the center and frosted her torso and the cake to look like a fancy ball gown! These girls are ones I was at school with from 3rd grade thru HS graduation, or most of them anyway. Two of them were at the surprise "Sweet Sixteen" party my parents threw for me. I was kinda delighted to see I remembered their names (my mom helpfully wrote them on the back of the photo). Ah, sidetracked by memories . 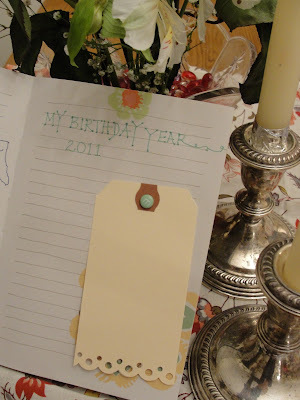 . .
Back to how I got to declaring 2011 "My birthday year." I was ready to make a big deal about this year's birthday, I just didn't know how to do so without making a big deal about my age! (which I didn't want to do). I thought maybe I would celebrate for a month. Jodie, at everything vintage, does. If you want to see how she celebrates her birthday to the max, start here! It is very impressive. But I knew I would never be able to post everyday for a month! It's a birthday! Every journal needs a little BLING! I mentioned the birthday commemoration idea to a friend from high school, who turns the same daunting number and she said, "Hey Marl, it's taken you a long time to reach this age," (don't you love the honesty of old friends?) "you should celebrate for a long time." Age doesn't matter. Friendship does! And that was the seed of an idea. To celebrate for the entire year. It has taken on a life of its own, it's no longer about me and getting to a certain age. It's about the word and the possibilities and having fun and going for baroque! It has been such a wonderful process. I have had the best time planning, and the year has only just started! It's all pretty fluid, this year. I mean, how can you plan out an entire year. Well maybe some people can, but not me. I change EVERYTHING, drives my son nuts. Travel, each season. Mark that aspect of a year. Make more art. Just do it! Have projects. Take time for things I have ignored . . .
Get through the horrendous piles of magazines all over the house. Read, rip out, recycle, give to the library mag exchange. Read books . . .
"The Classics:" F. Scott Fitzgerald & Wm Faulkner because I assiduously avoided them in college and feel I should have read them. Jane Austin & Huck Finn & Steinbeck because I loved them the first, second or third time I read them! Go Deep: Delve into a subject that interests me. Currently it's Native American culture, Crazy Horse and the warrior tribes. Or the early women's movement in America -- Elizabeth Cady Stanton, Susan B. Anthony, Seneca Falls, et al. Would art-making be easier if the worktable was kept clear? Happy Pink Saturday. Again, thanks Bev at How Sweet the Sound for hosting this great group of posts! Things completely unrelated to this post, but having to do with my daughter! I was amazed when I saw the photo of me sitting in the chair. 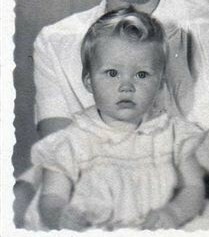 I look so much like my daughter when she was this age. Neither one of us has ever seen the resemblance, but that cute smile is a ringer for my sweet girl! I had dinner with her last night and she had nice things to say about how I have aged. It was sweet. At 23 (silly girl!) she has been worried about getting older and looking like a wrinkled old crone. She said that looking at me she realized she didn't have to look bad when she gets old, cuz I don't. I recommended my pricey, but effective skin care regimen. I thought the VERY same thing when I saw the photos of you... you and your daughter look like TWINS!!! I mean, it's like looking at your daughter in those photos... uncanny resemblance! Have a FUN and festive year ahead! 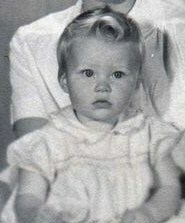 I love the birthday photos of you...such memories!! !